This is a great pin. 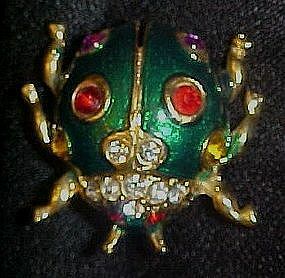 The emerald green beetle is enamel decorated over goldtone metal and encrusted with nice size colored rhinestones and clear white rhinestones. Measures 1 1/2" x 1 1/2" and is in perfect condition. Nice tight pin back and safety closure. No signature or name.